Alpha Leadership: Week Two | Grand Central Magazine | Your Campus. Your Story. This is the chant Central Michigan University students cheerfully shouted to Jesi Parker, assistant director of the Leadership Institute on campus. Week two started off on a cheery and patriotic note as students flooded Powers Hall in red, whites and blue. The packed environment was filled with students of different backgrounds and majors who were ready to learn and take another step forward in their leadership journey. Individual teams split up and played games such as “Gutter Ball,” which shows accountability in teamwork and allows students to discuss problems or challenges they faced throughout the game. Facilitators and students who have already been through the Alpha Leadership experience, watched and assisted students to reach their goals of the game. “I never went through Alpha Leadership as a participant, but I wanted to become a facilitator because I wanted to meet new people and form connections to leaders on campus,” said senior Allan Sulier, a facilitator for the program. 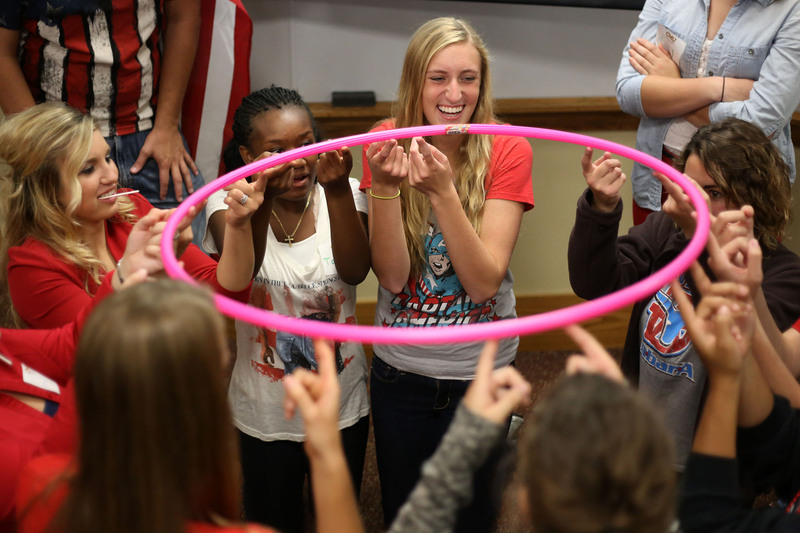 During the five week program, students take steps in trying to discover and enhance their leadership skills as well as form connections with leaders on campus. CMU pushes students to become leaders on campus and in life by being the first university in Michigan to provide a leadership minor, and most students who are in the Alpha Leadership program are also leadership minors. “Being in Alpha Leadership allows you to experience every type of leadership, because not everyone leads in the same way,” Sulier said. As week two comes to an end, students are one step closer to finding their own leadership style and connecting to leaders on campus. Separator image Posted in Campus, Events, Students, Students and tagged with Alpha Leadership, Central Michigan University, Jesi Parker, Leadership, Leadership Institute, Megan Zaleski.